Recently returned from the North Cascades, our memories of peaks, passes and lakes are still fresh. Keyla and myself are lucky to have experienced such beauty, serenity, solitude. We were dwarfed by peaks, swam in cold lakes and hiked many miles on the well-maintained network within the North Cascades National Park as well as the Okanagan Wenatchee National Forest. What a privilege! Click here to see all of our pictures. Thanks to good friends Jim and Gail, we were able to park at their house on Twisp River Road and get a ride to the trailhead. Starting on South Creek trail from Twisp River Road, we made our way to Louis Lake for the first night. Previous visitors and day hikers had left and we enjoyed the evening light as well as morning quiet alone. No mosquitoes bugged us, and the flies were mostly polite. The next day, we hiked over South Pass, McAlester Pass and down the Rainbow Creek Trail towards Stehekin. Original plans to camp at High Camp were abandoned due to the lack of water and abundance of mosquitoes at McAlester Pass! During just a short stop for pictures Keyla’s face was covered in bugs, and even though I wore a bug net over my head, the beasts still found access on my arms, wrists and ankles! This day turned into a long hike of 21 miles/34 km after we decided to go all the way to Stehekin (rejecting other campsites on the way due to lack of accessible water or shade), arriving at Mark’s house around 7:30pm. During the hottest time of the day we rested in the shade along the trail (see the picture of the nodding-off dog!). 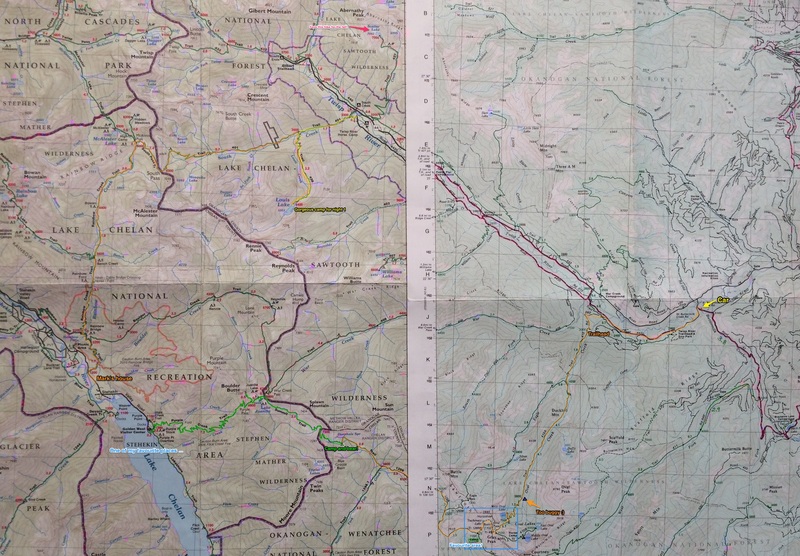 Here are the two GPS tracks for that day (watch needed recharging during our break …): Part 1 and Part 2. Being a favorite place of mine, time in Stehekin was of course too short. Seeing friends, relaxing the feet, resting for the hike back. Thank you to Mark for hosting us! Keyla loves the freedom of a house on the edge of a national park with no other buildings nearby, being able to chase sticks, swim in the creek or hang out on the patio. A few days later, starting at 7am, we made our way up Purple Creek Trail. The statistics are intimidating: 57 switchbacks, 7.5 miles, 1200ft to 6900ft at the pass. Check our GPS track here … However, it was cool, time passed quickly and at 10:40am we stood at the pass. A quick side scramble up Boulder Butte (7350ft) gave us the best views! We passed by Juanita Lake, left the park and spent the night at a campsite near Deephole Spring (total elevation gain for the day 2280m). Best moment here: After setting up camp, I explored the perimeters of the campsite to see if there was a toilet hidden somewhere (often Forest Service camps have primitive toilets). Crossing the creek that runs through the site, Keyla was bouncing through knee-high brush ahead of me to the right when a black bear came out of the bush from the left and started bouncing behind her! Both were maybe 6-7 m from me. While Keyla was surprised about the playmate, she continued her circle of bounces and enjoyed the company! The bear never charged or got closer to her, just followed maybe 1-2m behind her through the meadow. After I watched in awe for a short while, I called Keyla and clapped my hands (the bear showed no interest in me though). Noticing that it was an adolescent, I decided to remove myself to not pose a threat to any mama bear that may be watching. I turned, kept calling Keyla and a few seconds later she was behind me and the bear was gone. Back at camp, she continued to look that direction, missing her playmate 🙂 What a privilege to watch like-minded creatures (one young, one young at heart!) enjoy unexpected play time together (Keyla has seen bears before but only from very far away; I wonder what went through her head!). 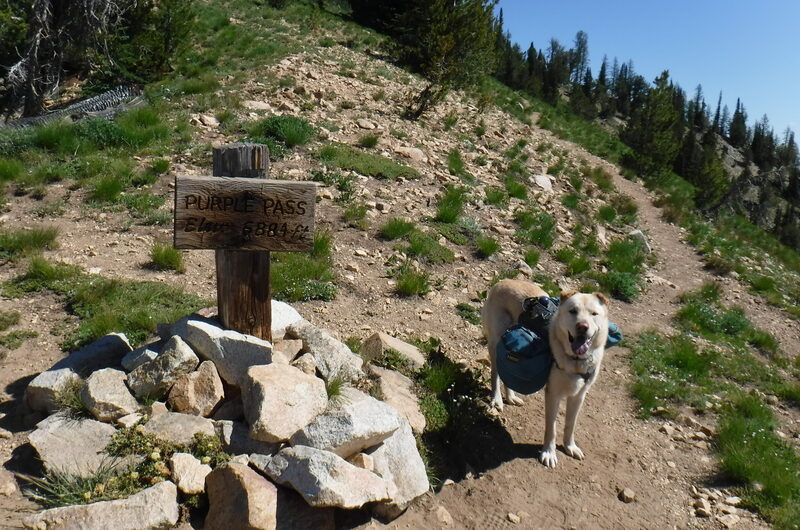 The following morning, we hiked on the Summit Trail to Tuckaway Lake and Horseshoe Basin, with a wide swing of a trail to Oval Pass at 7700ft. This, by far, was our favorite spot. The views are breathtaking! From there, Oval Creek Trail descends steeply past West Oval Lake towards the Twisp River drainage. A horse party was being picked up at West Oval Lake with 15 horses coming up the steep trail! We also ran into a guy with one dog and four goats – they were so curious to smell Keyla and needed some yelling from the owner to continue walking. Plans to add a trip to Scatter Lake were postponed to the fall (it’s easily accessible for a day hike), avoiding carrying the backpack on tired shoulders and hiking during a very hot day. Overall … what a trip! Keyla has been an amazing backpacking companion. No hesitation, no complaints, always ahead of me exploring all day. However, after the big final day we were both tired, the feet were achy and we so welcomed our friend Jim and Gail’s hospitality. A shower and bed have never felt better! We had sunshine and clear skies every day, with no smoke. Six Moon Designs Fusion 50 Backpack – Light, comfortable and easy to pack. With food for 3 days and 1l of water, I started out with 25lbs. Western Mountaineering Summerlite 0C/32F sleeping bag – So small and light yet warm! I always use a Sea to Summit Expander sleeping bag liner … just much more versatile to adjust to different temperatures. Ruffwear Highlands Dog Bed – That’s where Keyla curls up for the night, for an afternoon nap, for a sleep-in. Light, durable and easy to wash. And of course she carries the bed and her food with the (much abused but still holding up) Ruffwear Palisades pack. Therm-a-rest ZLite Sol foam pad – Simple, indestructible, my companion for every hike. I did add a Sea to Summit Ultralight Insulated pad on the return trip and am liking this as well (have only used it for one night but the integrated pump sack is genius). And of course, I don’t go anywhere without various pieces of Eagle Creek organizers, whether it is ultralight backpacking or overseas travel with carry-on only! Biggi… you M’Dear are a marvel.. and clearly the stars were aligned as your path crossed with “dawg..”if ever there was a match made in heaven… this must be it.. enjoyed the trip… thx.. The Oval/Star Lake area is one of our favorites. Great “dog bouncing tale”, Biggi. What a great story and a great trip!